Stefano Landi (1587-1639) is possibly best known, operatically at least, for his 1632 Il Sant’Alessio. His opera on the Orpheus legend, La Morte d’Orfeo, dates from around 1619, and therefore post-dates Monteverdi’s L’Orfeo by just over a decade. It is described as a ‘pastorale tragicommedia’ (a pastoral tragicomedy) and the libretto is unascribed; some speculate it is by Landi himself. It is considered by some as the first Roman-style secular opera – the ensemble numbers are especially related to the Roman style. The score is held at the British Library. Cast in five acts, it was heard here in Amsterdam’s stylish Muziekgebouw, without interval, which gave the audience the opportunity to properly immerse itself in Landi’s canvas. The opera deals with issues of misogyny and cruelty (Orpheus’ hatred of women after Eurydice’s descent into Hades and his encounter with the Maenads, who represent the women he has abused – cursed – before he met Euridice and who dismember him; it is impossible not to think of the #MeToo movement in the present World). From that perspective, the dramatic thrust is darkly powerful, certainly something honoured here, although Audi also enjoys the lightness of the party the Gods hold in honour of Orpheus’ birthday to distract the hero from his sorrows. Once Orpheus arrives in the Underworld, he discovers that Euridice has forgotten him; there is something of a happy ending in that Orpheus is eventually accorded a place in the Heavenly firmament. It is with this opera that director Pierre Audi bids farewell to his position of Artistic Director. Audi has been with Dutch Opera for some 30 years, during which time he brought Holland its first fully-staged Ring cycle. He also directed the Monteverdi Orfeo opera in 1995; here, finally, are his thoughts on Orpheus’ fate thereafter as expressed by Landi. In his booklet essay, ‘Orfeo – Clown of the Gods,’ Audi refers to the Landi as a piece he has been ‘yearning to direct’. He allows us to see the struggle between Apollonian and Dionysian character traits that exist within Orpheus. When he has passed over, Orpheus meets Euridice, but she has drunk the waters of the river Lethe which has caused her to forget him forever; Orpheus is turned into a star, which Audi intriguingly refers to as ‘a Christ to worship and celebrate’, reflecting Audi’s belief that the influence of the Roman Catholic church on Landi’s interpretation of the myth is marked; we must not forget, also, that Landi was maestro di cappella in Rome itself, as well as in Padua. 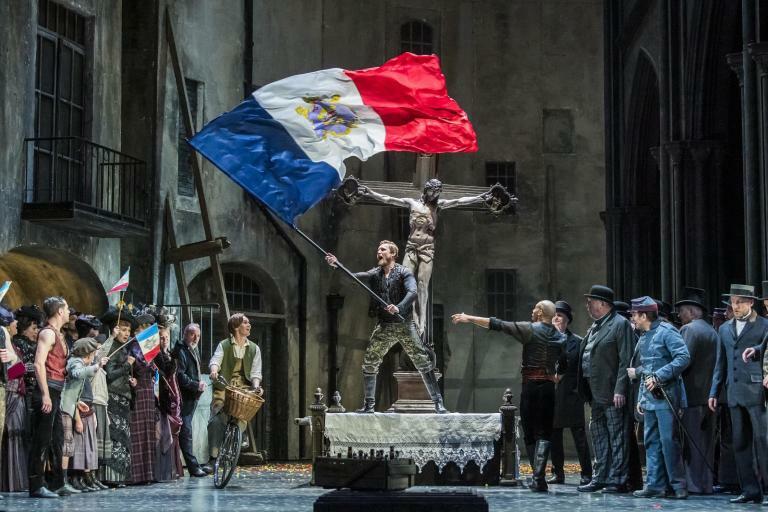 The staging, in tandem with the superb, alive pacing of Rousset, brought the work to life. A tree hangs suspended, bare in what would be above ground but with its roots beflowered with roses: a reflection of the bareness of Orfeo’s existence without Euridice, perhaps, and what Hades has to offer as she is there? Or, perhaps, a reflection of the resonances of the journeys of the likes of Orfeo or the ancient Sumerian Goddess Inanna/Ishtar’s journey to the Underworld of Kur; metaphors for the explorations of the netherworlds of our own psyches as our only true path to salvation. An extension of this, perhaps was the gold semi-circular reflective surface used at one point to offer characters reflections of themselves; but can they see themselves as they really are? Audi split the stage often, enabling movement from one energetic space to another seamlessly. The journey from dark to light was encapsulated brilliantly in Orpheus completely covered in black and his change to a glittering silver suit that reflected specs of “starlight” all over the auditorium. The choruses are performed by the characters on stage in an attempt to not only solve dramaturgical problems but also to ensure that one feels that all characters are in some way responsible for Orpheus’ end. There is a hint of bookending that Audi works with Rousset here: they collaborated on Monteverdi’s Poppea in 1994, at opposite ends of Audi’s stay tenure at Dutch Opera. The sheer beauty of the sound extracted by Rousset from his forces at the opening of La Morte d’Orfeo, coupled with the magnificent discipline of the players, was utterly remarkable. The Muziekgebouw is not a large opera space, but the sound seemed perfectly calibrated, the balance between orchestral forces and singers perfectly judged. Cecilia Molinari was a superb Teti (the water goddess Tethys) at the opera’s opening (‘Teti del mar, regina’), her multiple roles climaxing in a superbly affecting Euridice, while the bass Alexander Miminoshvili gave a superbly focused and affecting monologue, ‘Lascia, Diana, omai le’erranti spere’; it was while in the character of Nisa that Molinari really shone, though, her execution absolutely faultless. In the cast list for the opera, Orfeo was actually listed eighth: he does not have a huge amount to sing, but what he does have is unutterably potent. Argentine tenor Juan Francisco Gatell was deliciously light-voiced and agile in his extended aria ‘Gioite al mio natal, crinite stelle’. His phrasing in the later stages of the opera was simply stunning. Bacchus is of course a vital role, and was taken here by the Polish counter-tenor Kacper Szelazek (doubling as Mercurio), strong of voice and with great presence. Szelazek will make his Boston Early Music Festival debut next year in a recently discovered opera, La libertà contenta, by Steffani. The stand-out vocal contribution of the evening, though, came from the Aurora of mezzo Gaia Petrone. Like the contralto Sonia Prina, who has impressed hugely in the past, Petrone has the ability to make us forget the intervening years between the composition and the now; emotions are as real and present as they would be in a person today (incidentally, there is also a curious resemblance between the two singers physically, rather bizarrely). Another superb assumption was Magdalena Pluta’s Calliope (Orpheus’ mother) in the fourth act, where the brief but magnificent aria ‘Il desio di veder l’amato figlio’ encapsulated all that is great in Landi’s writing: interior expression encapsulated briefly, with a sort of proto-Webernian concision contained within Landi’s own harmonic vocabulary. Salvo Vitale was a fabulously present Caronte (Charon), the boatman of the Underworld, his final act scene with Orfeo brilliantly done; Emiliano Gonzalez Toro was a superbly focused Ireno. Lovely to have surtitles in both Dutch and English. The programme booklet included the complete libretto in Italian and in Dutch, a real luxury (if only we did the same here in the UK). A word on Les Talens Lyriques, the instrumental ensemble that conjured up universes of sound from the pit. They seem an extension of Rousset’s thought processes; more, it is safe to say that I have never encountered such technical perfection from authentic instruments before, whether in articulation, accuracy of attack or in tuning. Apparently at one stage of discussions, a coupling of Landi and Sir Harrison Birtwistle’s The Mask of Orpheus was considered, but proved to be too ambitious; one can only speculate on how magnificently effective this might have been, not only given Birtwistle’s respect of early music but also his complementary methodology to this production of splitting the stage into two – to tell two versions of the Orpheus myth simultaneously, at one point, for example. But one can only dream. It seems Amsterdam’s operatic life is vibrant; opposite my hotel, at Dutch National Opera itself, there was Aus Licht, in which Pierre Audi had also had a hand with ‘Mise-en-space’. Aus Licht is a three-day festival of Stockhausen’s magnum opus Licht, drawing on all seven days. No reason to suspect that that won’t be any less stimulating than Audi’s Landi.